Including hand electrode and grounding cable. 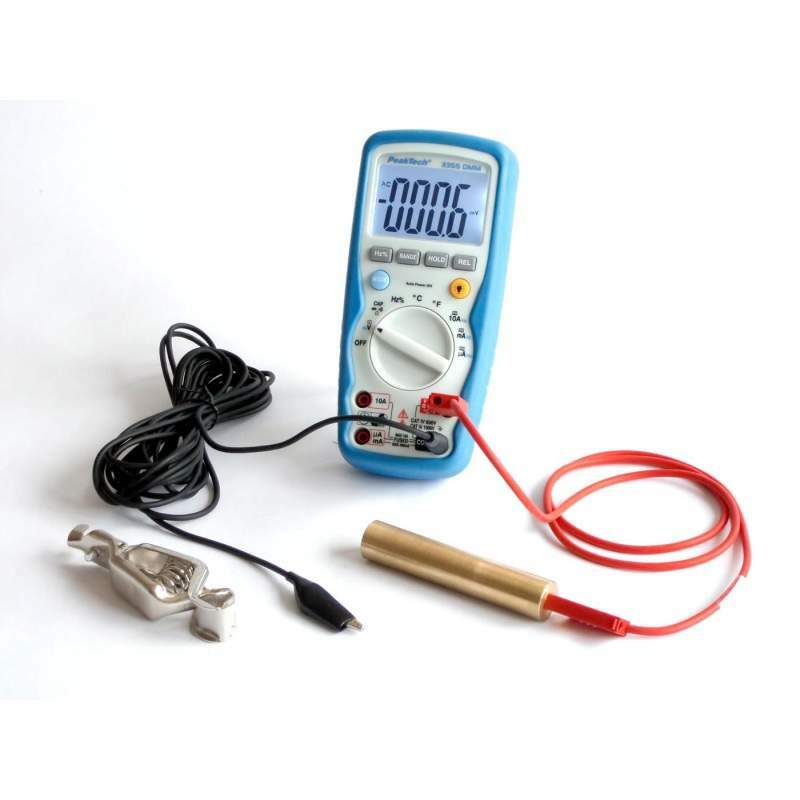 Suitable for measurements of the capacitive body voltage following the standard guidelines of the building biology measurement technology (SBM). A useful supplement for field strength measurements. For best results you should connect the black grounding wire to an independent grounding rod close by, e.g. in the garden. 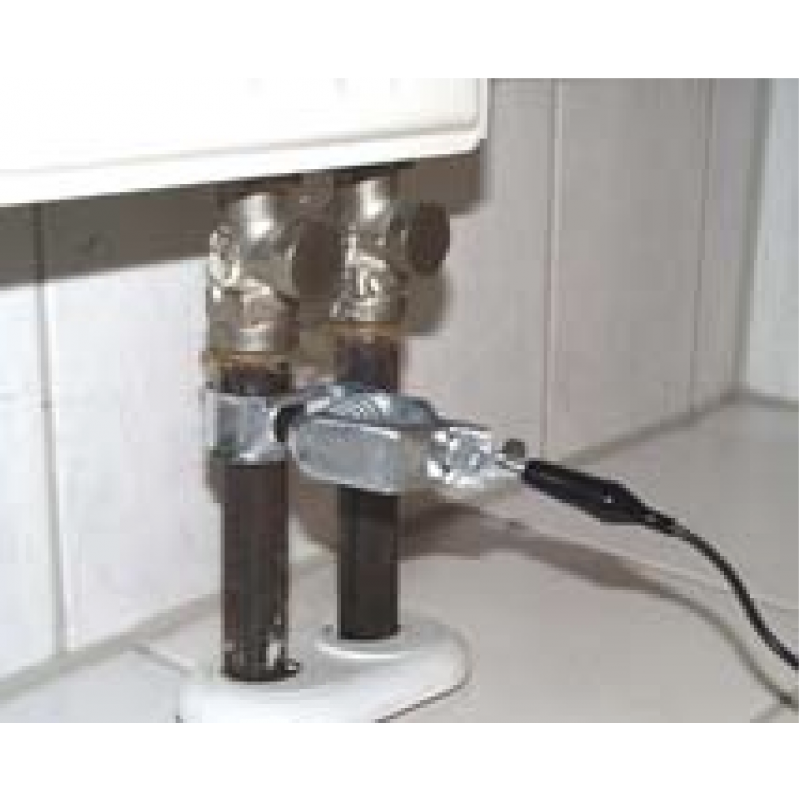 If this is not possible the best solution is to connect to metal heater pipes or water pipes with the included big grounding clip (see picture). If an electrician is available it is possible to connect it under his control to the grounding wire of the power line. Caution! Never try to connect it to the line by yourself, serious injuries may occur. Put the main turning switch to the position “V”. Push the blue button once (to the left of the display must appear the marking “AC”). The auto range mode is preset. When body voltage is below 1 volt switch to the more sensitive measurement range “Millivolt”. To do this push the button “RANGE” several times until you see “mV” on the right side of the display. For a less sensitive measurement press blue button again until “Auto” is displayed on the LCD. The person to be measured sits or lays in the position where the body voltage is to be measured (the measurement is “position-sensitive” and will vary from place to place and position to position). Hold the hand probe tightly in one hand. All power lines that could cause capacitive coupling should be connected to the wall sockets. Other people can influence the measurement and should never stand close to the person to be measured. The person to be measured should not have direct contact to the black grounding wire and should not touch the instrument because of the resulting capacitive coupling to the ground. The measurement of the body voltage does not replace a measurement of the field strength of low frequency (LF) alternating fields. Because of superposition of fields dependant on the place of measurement, sources should be minimized even if they compensate each other resulting in a lower reading of the body voltage. - Place the hand electrode close to a power line cable or AC-Adaptor so that minimum of 0.500 Volt is displayed. Now put the black ground wire to different grounding systems. If it is possible use a metal grounding rod in the garden. Pour some gallons of water on the grounding rod to ensure a good connectivity to the earth. Wait for about 5 Minutes so that the water can soak the earth. If the reading does not change significantly the reference ground is good for measurement. If there are big deviations in body voltage dependent of the used grounding system, you have to check the grounding system by a licensed electrician. For preliminary measurements use the grounding that causes the highest readings. 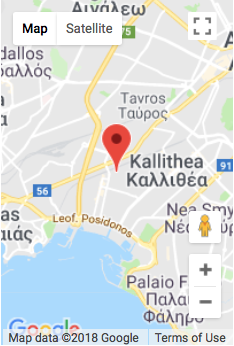 Πράσινο Ενσύρματο ακουστικό για όλα τα τηλέφωνα με βίσμα 3,5 mm Επίσης κατάλληλο για tablets και υπ..
Μετρητής Ακτινοβολίας Χώρου χαμηλών συχνοτήτων 16Hz - 2 KHz Προϊόν επί παραγγελία - Χρόνος πάράδο..
Μετρητής Ακτινοβολίας Χώρου χαμηλών συχνοτήτων 16Hz - 100 KHz Προϊόν επί παραγγελία - Χρόνος πάρά..